This MAb recognizes a protein of 65-76kDa, which is identified antichymotrypsin (AACT). AACT is a plasma protease inhibitor synthesized in the liver as a single glycopeptide chain. In human, the normal serum level of AACT is about one-tenth that of ? 1-antitrypsin (AAT), with which it shares nucleic acid and protein sequence homology. Both are major acute phase reactants ;their concentrations in plasma increase in response to trauma, surgery and infection. Elevated levels of AACT are widely, but not universally, reported in the cerebrospinal fluid and plasma of AD patients. Prostate-specific antigen (PSA) and its SDS-stable complex with AACT are in widespread use as markers for the diagnosis of prostate cancer. AACT deficiency may also be a possible cause of chronic liver disease. 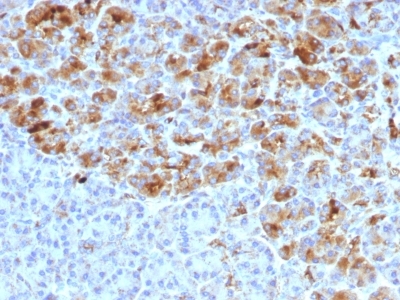 AACT antibody reacts with histiocytes and histiocytic neoplasms. It is widely used to identify histiocytes and tumors derived from them. Acinar tumors of the pancreas and salivary gland may also exhibit AACT positivity. Anti-Human Alpha-1-Antichymotrypsin Positive Control Sample: HeLa Cells. Tonsil, Pancreas or Histiocytoma. 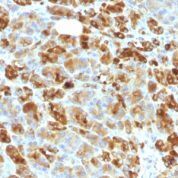 Variations in Alpha-1-Antichymotrypsin antibody staining intensity in immunohistochemistry on tissue sections are present across different anatomical locations. Low, but measureable presence of Alpha-1-Antichymotrypsin could be seen inglandular cells in the adrenal gland, breast, cervix, uterine and epididymis, cells in the tubules in kidney, hepatocytes in liver, exocrine glandular cells in the pancreas, glandular cells in the parathyroid gland and seminal vesicle, cells in the seminiferous ducts in testis, Leydig cells in the testis, urothelial cells in the urinary bladder, hematopoietic cells in the bone marrow, glandular cells in the breast, glial cells in the cerebral cortex, glandular cells in the cervix, uterine and gallbladder, myocytes in heart muscle, cells in the tubules in kidney, hepatocytes in liver, germinal center cells in the lymph node, non-germinal center cells in the lymph node, exocrine glandular cells in the pancreas, glandular cells in the parathyroid gland and prostate, smooth muscle cells in the smooth muscle, adipocytes in mesenchymal tissue, Leydig cells in the testis, glandular cells in the adrenal gland, breast and cervix and uterine and epididymis. We were unable to detect Alpha-1-Antichymotrypsin in other tissues. Disease states, inflammation, and other physiological changes can have a substantial impact on antibody staining patterns. These measurements were all taken in tissues deemed normal or from patients without known disease. 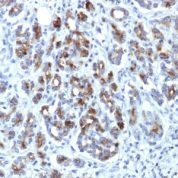 Tissues from cancer patients, for instance, have their own distinct pattern of Alpha-1-Antichymotrypsin expression as measured by anti-Alpha-1-Antichymotrypsin antibody immunohistochemical staining. The average level of expression by tumor is summarized in the table below. The variability row represents patient to patient variability in IHC staining. enQuire Bio's Alpha-1-Antichymotrypsin Anti-Human Monoclonal is available for Research Use Only. This antibody is guaranteed to work for a period of two years when properly stored.